The Nashville Sounds announced today they have signed a four-year Player Development Contract (PDC) with the Texas Rangers, which will run through the conclusion of the 2022 season. "This is an exciting day in Nashville Sounds Baseball history," said Sounds General Manager Adam Nuse. "Forming a partnership with one of the most well-respected organizations in Major League Baseball is thrilling for our organization and the City of Nashville. 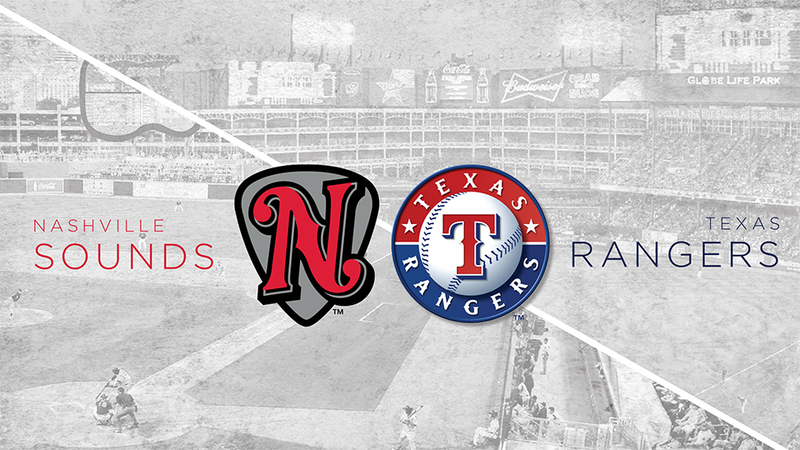 With leadership from Ray Davis, Neil Leibman and Jon Daniels, the Texas Rangers are a first-class franchise and we're ecstatic to build this relationship." Texas is the eighth Major League team the Sounds have affiliated with since the franchise was founded in 1978. The Rangers have created a winning culture with an 849-761 (.527) record over the last 10 years. Texas has won four American League West Division Championships during the stretch and has played in two World Series (2010 & 2011). During that same 10-year span, Rangers Triple-A affiliates have produced a 721-705 (.506) record with three division titles. "The Texas Rangers are very pleased to enter into this four-year Player Development Contract with the Nashville Sounds," said Texas Rangers Co-Chairman and Managing Partner Ray Davis. "Led by Frank Ward and Adam Nuse, the Sounds are one of Minor League Baseball's top organizations." "The Sounds have received incredible fan support as the franchise finished fourth in Minor League Baseball in overall attendance with over 600,000 fans attending games at beautiful First Tennessee Park in downtown Nashville in 2018. For a number of reasons, this became a very attractive location for our Triple-A club and we look forward to a productive relationship with the Sounds," said Davis. "The Nashville Sounds front office has a great reputation of taking care of its players, and we believe this is a tremendous opportunity," said Texas Rangers President of Baseball Operations and General Manager Jon Daniels. "I think our players and development staff will enjoy playing and working in an environment with first-class facilities and an exciting game atmosphere." Since opening state-of-the-art First Tennessee Park in 2015, over two million fans have passed through the gates to watch Nashville Sounds baseball.